We can help you find the right ribbon for your label printer. Weber's long experience with thermal-transfer print technologies and compatible label materials has given us a broad understanding of exactly which ribbon is best suited for any application. Our thermal transfer ribbons operate with a wide variety of label printers including Zebra, Datamax and Sato and printer-applicators from today's leading manufacturers. Each ribbon is formulated to print high-density bar codes, text and graphics for product identification, work-in-process, inventory control, shipping and other applications. Weber ribbons including our new Go-Mark 100 economical wax ribbons, wax/resin ribbons, and durable resin ribbons for harsh environments can be found on our Go-Label ecommerce site at great prices! For general labeling applications, we recommend the economical Fastprint II ribbon. This high-performance, wax-based ribbon is compatible with Weber's extensive line of paper, film and vinyl label materials. The perfect ribbon for everyday use, Fastprint II is ideal for product identification, shipping applications, as well as compliance labeling. When used with Zebra, Datamax and Sato printers, the ribbon produces high-resolution bar codes, text and graphic images on blank or tinted surfaces. Our new Go-Mark 100 standard wax formulation thermal ribbons are perfect for printing when using Datamax, SATO and Zebra thermal label printers. These thermal ribbons are guaranteed to work effectively on all standard white paper-based labels listed on this site and each ribbon comes with a Clean-Start leader built in. Go-Mark 100 ribbons have been tested by our QA labs to ensure that they perform as good or better than most standard wax ribbons. And they are made in the USA! Cleanmark is our resin-enhanced, wax formulation that comes with a unique Clean Start™ feature. Positioned immediately following the ribbon's leader, Clean Start acts like a printer cleaning card to remove printhead debris. All of our performance wax ribbons are ideal for use with our complete line of desktop thermal-transfer printers and printer-applicator print engines. Our Ultraplate II ribbon, recognized by Underwriters Laboratories, is ideal for electronic component labeling, outdoor or property/asset management labeling and other applications that require superior abrasion resistance. With this ribbon, which also includes the Clean Start leader, imprinted bar code labels can endure many years of exposure to heat, abrasion and repeated scanning. Weber's wax/resin Duraprint II and resin PrintGuard ribbons offer enhanced abrasion resistance on most thermal-transfer label materials at a very economical cost. 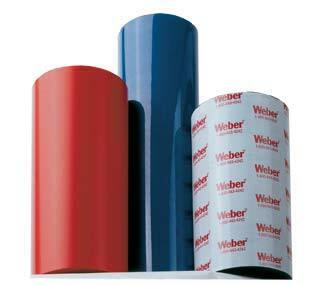 Both ribbons are highly recommended for drum labeling and other durable film label applications. Weber offers an array of colors in wax, wax/resin, and resin formulations for standard and near-edge printers. You can employ color to improve the appearance of your packaging, streamline your operation with color-coding, and aid in keeping your preprinted label inventory to a minimum. For additional information on what color can do for your operation, please consult your Weber account representative.